The twenty-third letter of the English alphabet, called double U and written in the Latin script. The twentieth letter in the Afar alphabet. (Internet slang) Alternative form of 萬／万 (wàn). Used only in loanwords and proper names with old spelling (compare Wirtanen). The twenty-third letter of the German alphabet. Related to the French Sign Language sign for "W". Posture the dominant hand in the “W” shape. The twenty-third letter of the Latin alphabet, called doppia vu or vu doppia in Italian. 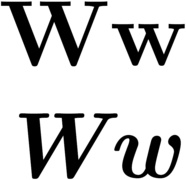 The letter W is not considered part of the Italian alphabet. It is found mainly in loanwords. The thirty-third letter of the Saanich alphabet, written in the Latin script. The twentieth letter of the Somali alphabet, called waw and written in the Latin script. The twentieth letter of the Somali alphabet, which follows Arabic abjad order. It is preceded by N and followed by H.